These incredible specialty glasses are hand pulled in limited runs, with very specific applications in mind. 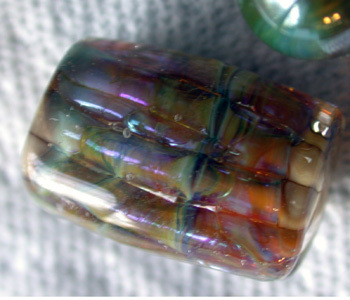 Colors are offered as either part of our permanent collection, available at all times -OR- colors that will be available in very limited quantities - "one time only, get it while you can glass". 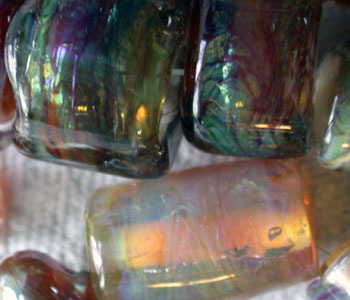 If you are part of the Artisan Advantage Program, you will be notified first when a new color is introduced as well as when the "one time only, get it while you can glass" is released. 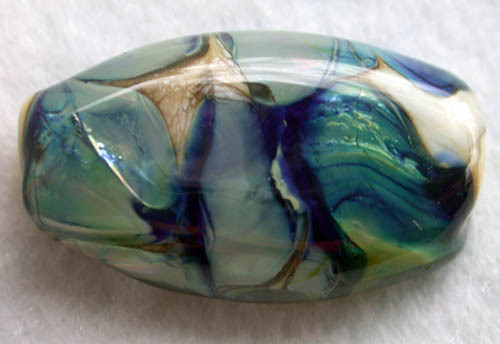 Named Moody Blue, because it can display so many lustrous variations. 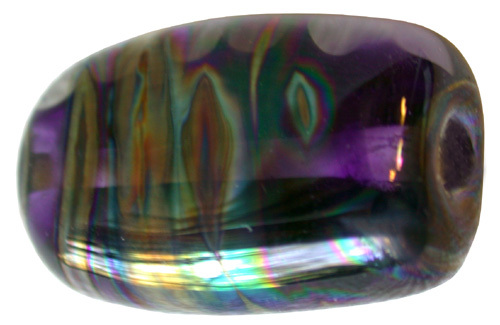 It reminded us of a Mood Ring. 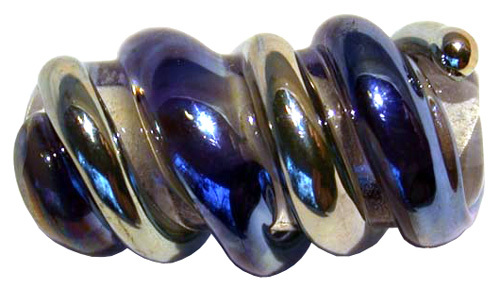 You can achieve silver, gold, metallic blue and metallic purple as single colors, or multi-color iridescent, oil-slick, rainbow colors. Best of all, you have control on how it comes out. Moody Blue is generally shinier than Purplescent. 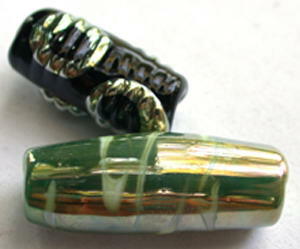 For pictures and instructions see below: Techniques for using BellaDonna Glass. 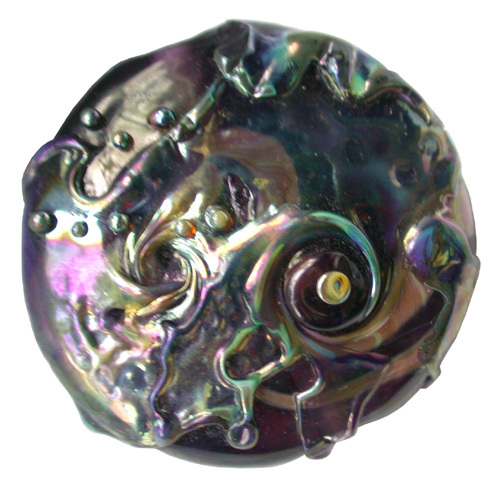 Purplescent can achieve all the same colors as Moody Blue, with the addition of bronze. 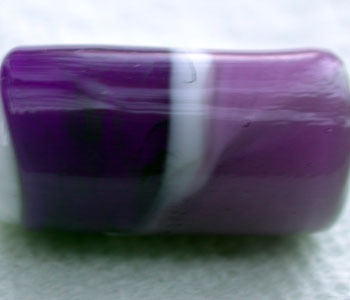 Purplescent colors have the intensity of Moody Blue, but are not as shiny. 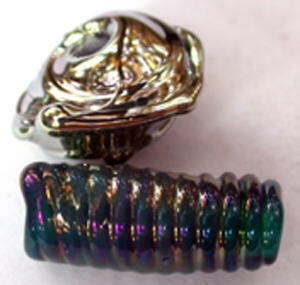 For pictures and instructions see below: Techniques for using BellaDonna Glass. Specially designed for thin stringer work, Black Diamond is a very dense black that is smooth to apply, yet is stiff enough to stay where you put it and resist bleeding and running into other colors under normal working conditions. Pull it down to thinner than a hair, to where it finally does become thin enough to see through, and it's still black! A black that does it all. 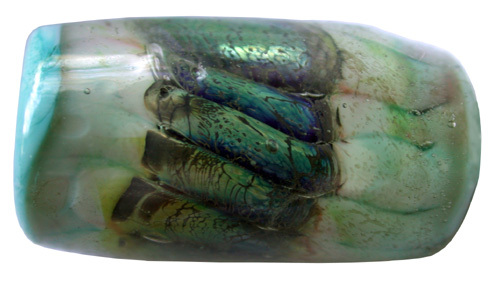 Aqua Splash is a beautiful blue green glass containing silver that reduces to bring up amazing lusters; from subtle, transparent golds and silvers to opaque creamy gold. 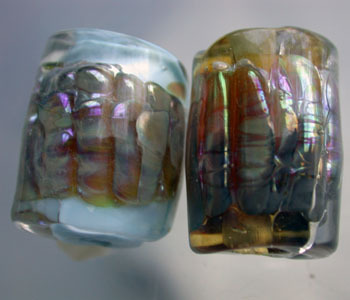 To produce a transparent luster, work the glass in a neutral flame and quickly apply a dragon's breath reduction flame as the final step before annealing. 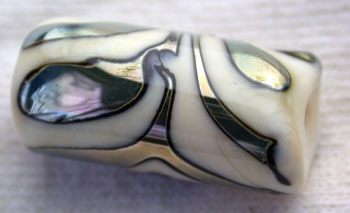 To produce an opaque creamy gold luster, work the glass for a longer time in any type of reduction flame. 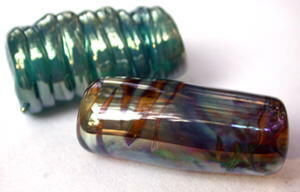 A flame and annealer striking glass that also reduces with a slight metallic sheen in a reduction flame. Starts out a beautiful honey color when very hot. 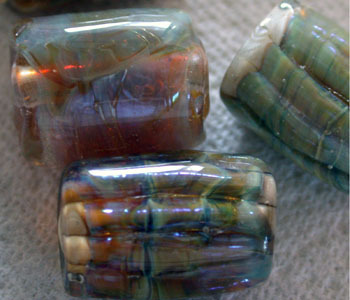 By working the glass in and out of the flame as well as closer and further out in the flame you can bring out a wide mix of colors, including sunset hues, honey, blues, greens, tans and browns. 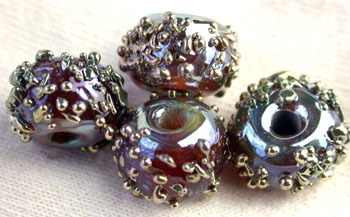 For pictures and instructions see below: Techniques for using BellaDonna Glass. 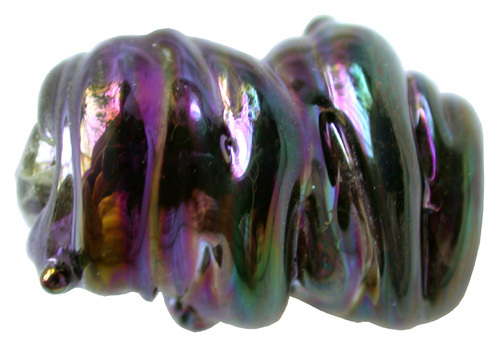 Dark, rich, transparent and reactive royal purple. 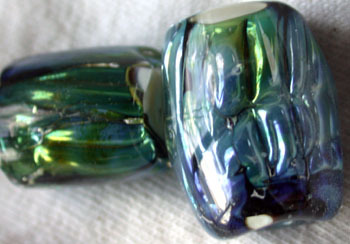 For pictures see below: Techniques for using BellaDonna Glass. 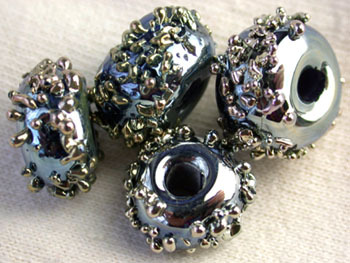 Midnight Magic is a dark Midnight Blue with a ton of silver in it. 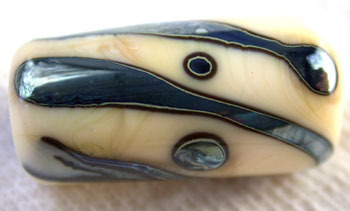 It reduces to bring up amazing lusters and reacts on some colors, like the ever popular Effetre Ivory, leaving a dark blue outline. 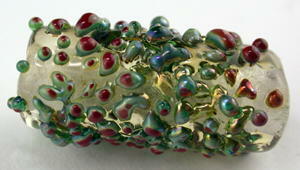 Available in rod and frit. 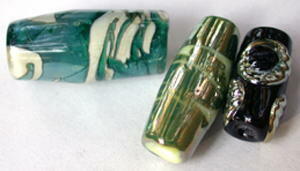 For pictures see below: Techniques for using BellaDonna Glass. 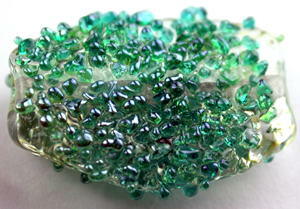 Teal-icious is a reducing transparent teal colored glass that will go through a range of colors depending on the reduction flame you use and time spent in the flame. 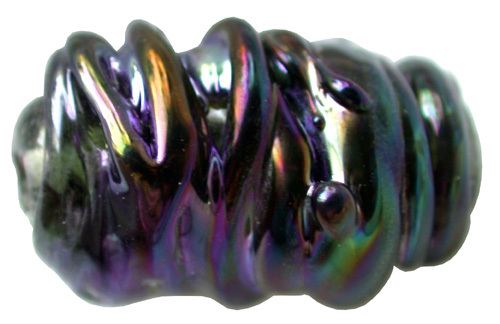 With slight reduction you can get a rainbow or oil on water look. 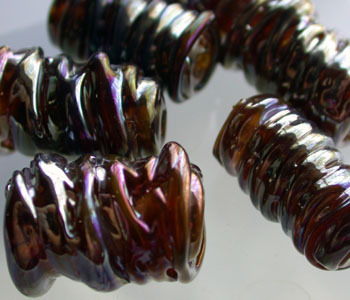 Full reduction (or dragons' breath flame) produces a bright silver very fast, longer in the flame produces a warm, bright gold and still longer you can get coppery reds. 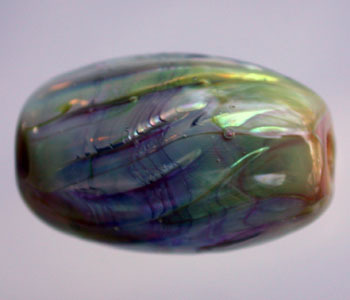 The iridescence holds up well after encasing, although too much heat will bring it back to its original teal color. 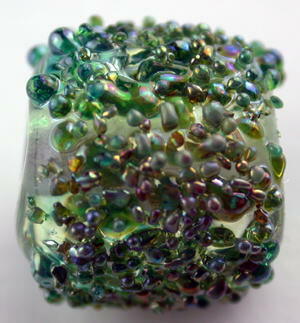 Teal-icious is very easy to reduce and fun to play with. 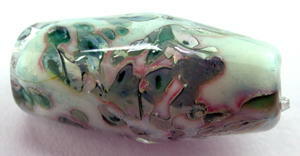 Available in rod and frit. 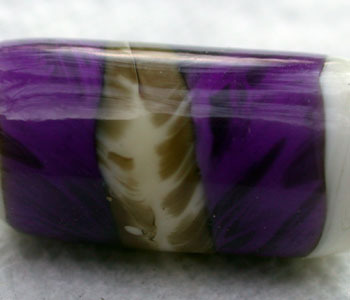 For pictures see below: Techniques for using BellaDonna Glass. 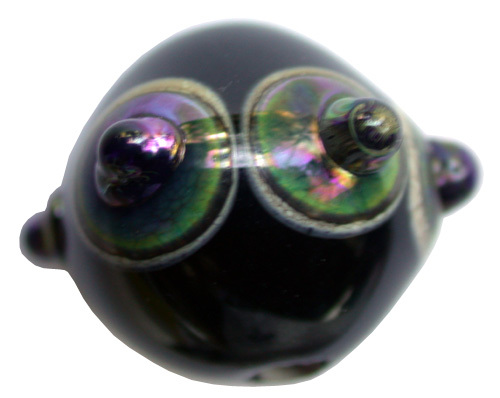 If you haven't yet discovered the magic of BellaDonna Glass, now's the time. 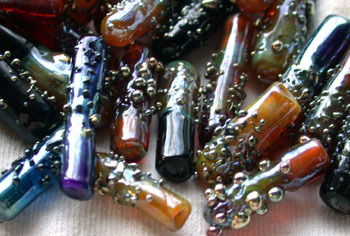 The Rod Assortment has rods of each of the 9 rod colors and the Frit Assortment has ½ ounce quantities of each of the 9 frit colors in assorted particle sizes. 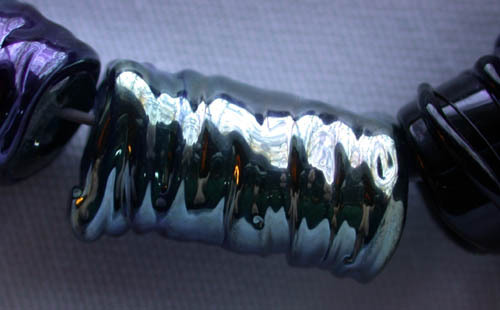 Normally, the smallest quantity you can purchase of a rod is one quarter pound and one ounce of frit. 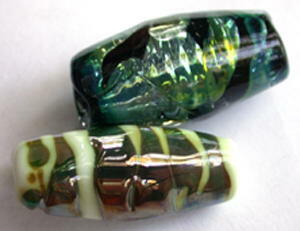 So, this is a great opportunity to try all the BellaDonna Glass colors at a great price. These tips will vary according to your torch, but with a little practice should be easily modified. 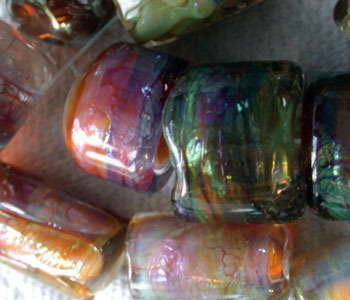 As the pictures below indicate, Honey Glaze can produce a wide range of color variation and opacity. It both strikes and reduces. 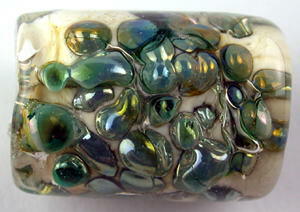 When applied thinly, the color will tend to be more transparent after striking. A thicker layer of Honey Glaze can become very opaque. 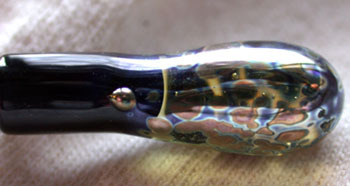 Striking can be done in the flame by working the glass in and out of the flame as well as closer and further out in the flame. 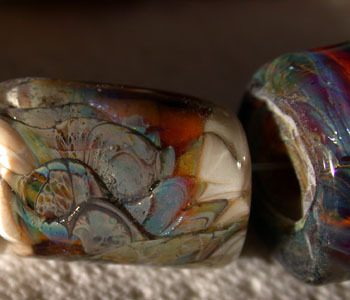 Allowing the glass to chill before reheating can bring out more dramatic color variation and deeper opacity. 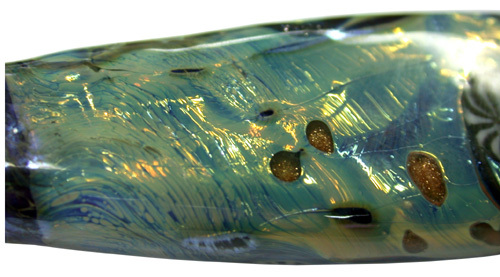 Additional color depth of the strike can occur in the annealer. 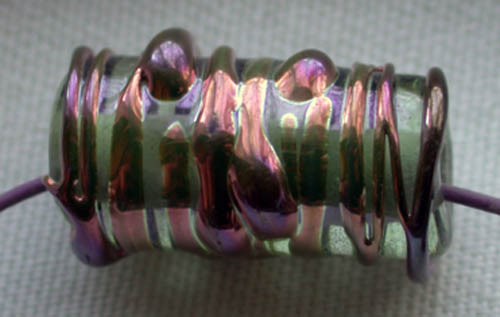 A slightly reduction flame setting at will bring up a subtle metallic sheen. 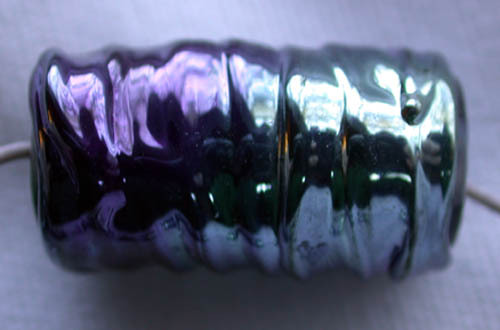 Right: Royal Purple on Effetre Ivory EP-264 - Reactive. 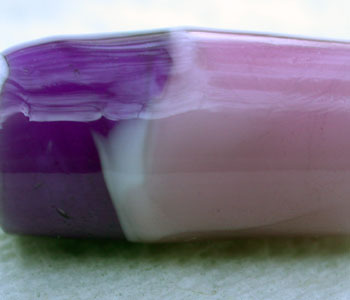 Second row: Left: Compares Royal Purple to Light Violet ET-41. 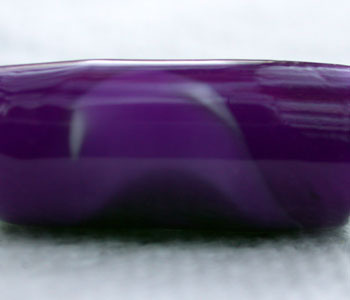 Right: Compares Royal Purple to Medium Amethyst ET-42. 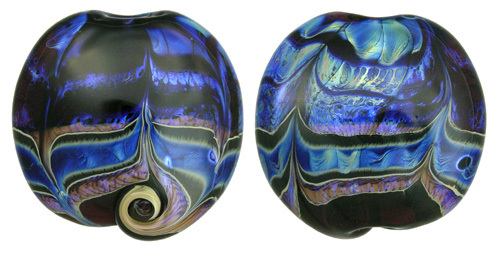 Moody Blue and Purplescent are reduction glasses. This means that when the hot glass is placed into a flame that is lacking oxygen, the glass will change in nature producing metallic lusters. 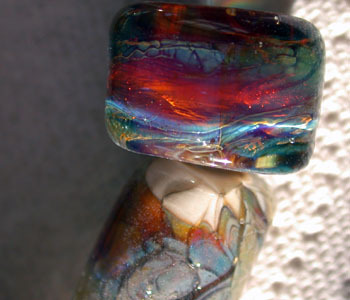 The temperature of the glass and the nature of the reduction flame setting work together in varying degrees will result in a wide range of dazzling lustrous colors. The following instructions show Moody Blue examples. 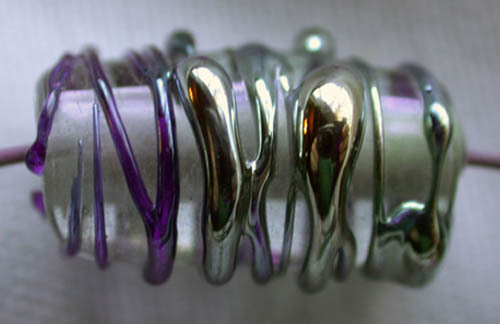 Below these instructions are examples of Purplescent, more Moody Blue and Midnight Magic. 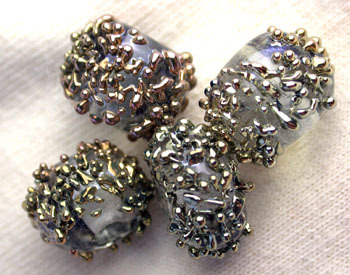 1 Silver – After all of your shaping is done, the last thing to do is to turn the parts of the bead with Moody Blue on it silver. 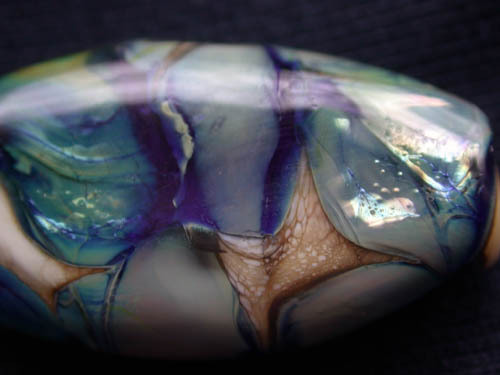 What works best here is to briefly heat the Moody Blue to a dull orange glow and then bathe it in the purple part of the dragon's breath flame until you see the shine come up on the bead. 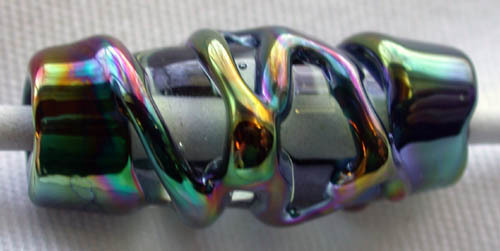 Anneal in the normal way. 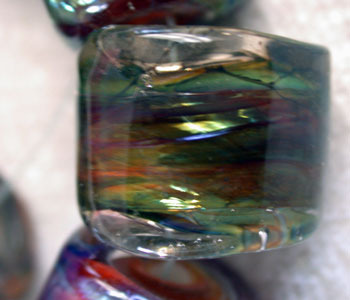 3 Multicolor Rainbow – To get this effect the Moody Blue should be applied to cooled glass – the base glass should have little or no glow left in it – then apply the Moody Blue – after applying hit the Moody Blue with enough heat to get a dull orange glow – then bathe it in the dragon's breath flame until you get the shiny silver – move it back to the orange part of the flame while you adjust the torch to achieve a high reduction flame. 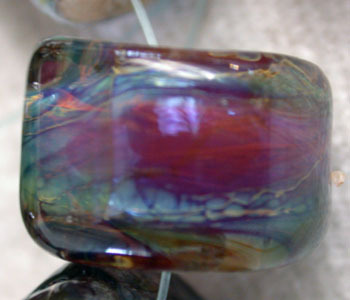 Bathe the bead briefly in the outermost white fingers of this flame, selecting small areas of the Moody Blue to put in the flame and dip it in and out until you see the color you want – then you can move on to another area getting many colors – practicing with this method should give you consistent results for colors you want to achieve.